I’d been talking about going to Bubba Mac’s for over a decade, but there never seemed to be the right time. They had been located on Highway 92, just north of downtown Douglasville, since 1997 but we never seemed to make it in (there location was not conducive to my traffic patterns, but they’ve developed quite a following). 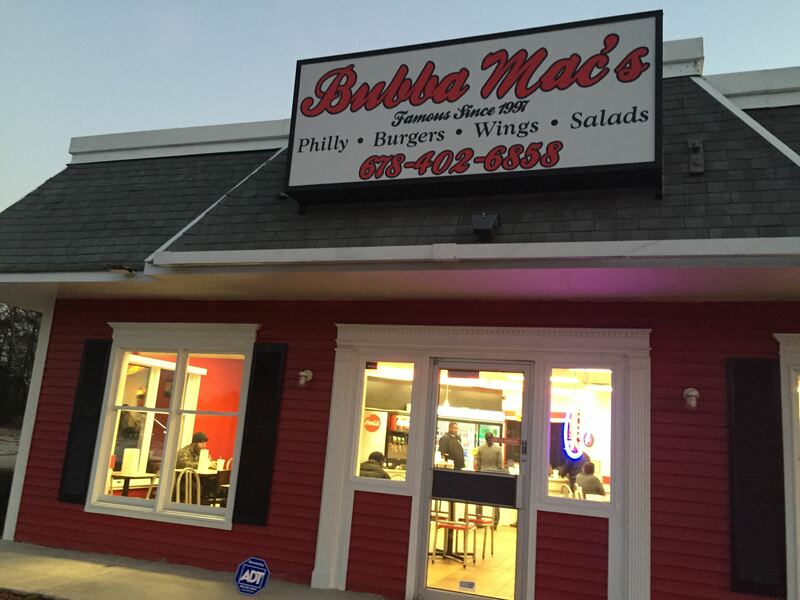 On this Saturday night, we had been doing some things around the house and I headed out to grab a bite, so on to Bubba Mac’s it was. But when I pulled into the (really hard-to-get-into-and-out-of) parking lot, I saw the sign on the door that they had moved. They had moved to the former KFC on Fairburn Road, just north of I-20. A little further up the road I went. After talking with the guy behind the counter about the lack of Georgia Tech paraphernalia, he explained, quite simply that “the colors didn’t match his scheme”. The decor is red, blue and black. His honesty humored me – the place is decorated in Falcons, Braves and UGA. They all match his colors. The first night, I picked up chicken philly cheese steaks to bring home. This was a really good philly cheese – the bread was crunchy on the outside, but soft and moist in the middle (this is key to a good philly cheese – it keeps the juices inside), the chicken to cheese ratio was nearly perfect and, when you order it with mushrooms, peppers and onions, they cook them throughout the sandwich. Since that night, this has become our “go-to” place for philly cheese sandwiches – we probably have them at least once every three weeks. On another day, we stopped in for a mid-afternoon lunch. I had wondered how they would do, from a business standpoint, in the new location. 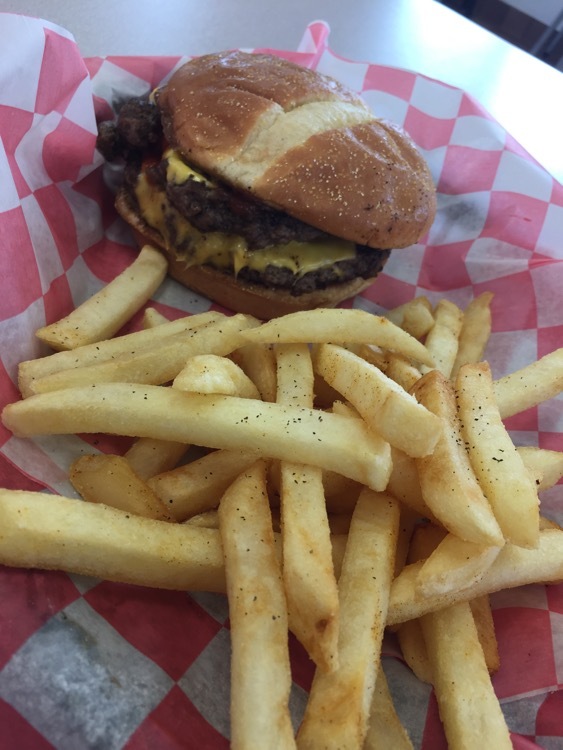 On this day, Jo had a philly cheese, but I ordered a burger – hand-made, 100% ground sirloin. While we were waiting on our food, Jo told Mike (the guy behind the counter above / the owner / “Bubba Mac” himself) that I was a food blogger. They chatted for a minute, and he grins at her and yells into the back “Make that burger a double!” Then he asks if we have had his wings. We had not so he sent out three for us to try. These were tasty wings. They were crispy with plenty of meat on the bone and the sauce was flavorful. and I noticed a drive through window last time I picked up sandwiches. 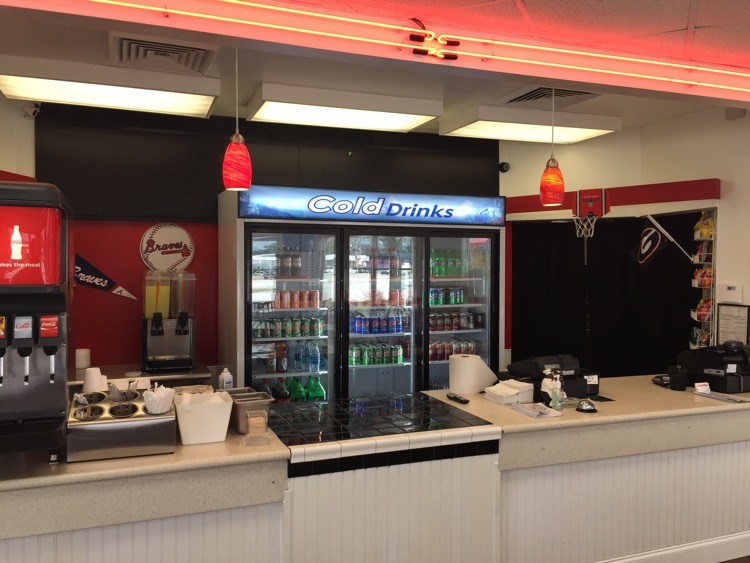 And business looks like it is doing well – there have been people there at all times I’ve been and there always seems to be someone picking up carryout (the hours are 11:00 – 11:00, Monday – Saturday). Good for him! In fact, the only downside is that you can only make a left out of the parking lot, due to the divided highway.